As long as variable annuities use an inverse pricing approach in assessing annual fees, they will never be in a customer’s best interests, so they will meet the fiduciary standard. Thanks for your comment Jim. My use of VAs is generally when a client brings one onto our relationship. When possible I try to do a 1035 exchange to a lower cost product. One a couple of very rare occasions we have used them, but always with a low cost, no surrender product. Love your insight as always Roger. I could not agree more on #2. For those that know what they’re doing, they can potentially be a very apt investment to use. I’ve seen way too many retail investors get into these leveraged ETFs and try and hold them long term only to see significant issues come into play. They can be good if you’re looking at daily swings, but few should really be actively using them. They should be left largely to the professionals and money managers. Thanks for the comment John. As the columnist I quoted in the Self-Directed IRA section said “… just because you can doesn’t mean you should…” Pertains to leveraged ETFs for most individual investors as well, though an excellent tool for professional traders and money managers. In regards to cost you’re correct that with M & E charges, investment management fees and Living Income Benefit riders, total expenses can run in the area of 3.30%, where in a managed retirement portfolio, between investment management fees and advisory fees the total can run in the area of 2.5%, with no downside protection. I would argue that most, but not all, individuals given these two choices would prefer paying an added 80 bps or perhaps more to be protected on the downside. You mention the Vanguard VA which could be an excellent choice for the “do-it-your-self investor,” however in the advisor world unless the advisor is charging a flat fee for all services provided, an advisor will undoubtedly charge an advisory fee on the entire portfolio, including the Vanguard VA (thereby raising the total cost to somewhere between 2.5% and 3.00%). The bottom line on all of this is that no individual or couple are the same. Consequently it’s important for advisors just like doctors, to keep an open mind and never stop learning how best to serve our clients. Thanks for your comment Scott. As I said in the post its not variable annuities that I am opposed to its the high cost versions that I so often see. I charge most new clients and a fair amount of my existing client base a flat fee so on those occasions when I use a VA it is generally Vanguard or a similar low cost no surrender product. As for the downside protection, I’d like to think a competent advisor is pretty good downside protection. Downside protection doesn’t (in my opinion) mean there will not be periods of losses, but rather that the portfolio and withdrawals will be professionally managed for the client to give them the best shot at retirement success. The investors who fared the worst during ’08-’09 were those who gave into their fears and sold. I do fully concur that no one size fits all with any type of investment, annuity, insurance product, etc. It is nice that there is no shortage of products and providers from which we can choose on behalf of our clients. I agree with Scott. There’s low cost VAs which provide very solid benefits over a vanguard product at 3ish percent, which is not high cost. When you say 2pcnt, you’re really limited to index investments, and some va’s have great guarantees offered on some pretty volatile asset claases like hedge funds, re, and pe. Also, there’s a vast world of fixed indexed annuities which offer stellar benefits in the 3pcnt (and disclosed!) all in fee range. Paul thank you for your comment. I’m sorry but I have to disagree with you when you say that 3ish percent is not a high cost. It is beyond high and I would be hard-pressed to endorse any product that charges those kind of fees. At that point I think the only one making out financially is the rep selling the contract. Thanks for your comment, and you hit the nail right on the head. One of the things I love about being a fee-only advisor is that I don’t have suggest products that I don’t believe in in order to make a living. Don’t even get me started on my thoughts on fear-mongering annuity sales types, especially those peddling index annuities. One question a friend of mine told me that he asks retirees (a question that I think is highly misleading) is: “How much of this retirement can you afford to lose?” Of course, a retiree hearing this question is going to be set up perfectly for the high-fee annuity pitch. Sad. IF annuities are that great for clients, then give them the exact same commission structure as mutual funds. 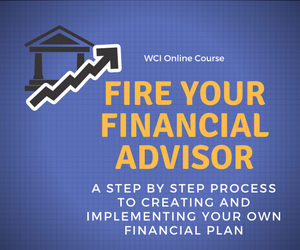 If the advisor is really looking out for the best interest of the client, then they will have no problem earning the same commission that they would earn from a mutual fund sale. That is a really bad question to ask in my opinion. I prefer to gain an understanding of how much cash flow/income is needed to support the client’s desired lifestyle and we work from there. As I understand it annuities are a great payday for many reps and sadly I’m guessing that many are sold for that reason and not because they are the best solution for a given client. I enjoyed your article. That said, what are your thought on index annuities? Thanks Brian, please see my last reply to the prior comment. Also under the annuity link in the category section on the front page of the blog there is an article that I wrote in late 2011 about Da Coach hawking index annuities, basically the product and most folks selling them make my blood boil. Hope tax season is going well and I look forward to the opportunity to meet you after April 15. Roger, I needed updated ammunitition for my dislike of annuities, and your blog and various reader comments provided many for me to use. I just heard one of those sales pitches on Friday saying 1.8% is the stock market gain in the past 10 years, and the VA was going to guarantee 3%. The scare tactics sales people use is working, and it is now more necessary than ever to have fee-only advisors like us available to do what’s best for the client. Susan thanks for your comment. Scare tactics is sadly a great description for how these products are too often sold. As I often say, I’m not anti-annuity, but I am against these types of sales tactics. Real advisors focus on what is right for the client in looking for solutions, too many financial product sales people take the approach that their product is the solution for any problem. I agree with you on the self directed IRA’s. When I was working with plan sponsors at VG, I tried to dissuade them from offering self directed IRA’s because of the potential damaging actions that participants can take using them. Without experienced advise there are too many investment options that could do very real damage. Suzanne thanks for your comment. I think you might be referring to the self-directed brokerage option that a number of 401(k) plans offer. Assuming this is the case, your point is well-taken. In the plans that I advise that offer this option it is pretty standard to have the participant sign-off on the risks they are assuming and to require them to attend an orientation session at the front-end as well. The self-directed IRAs that I was referring to in the post were from custodians offering to custody non-traditional and alternative holdings like a business, non-listed securities, real estate, a business and the like. Very risky as well and too often a breeding ground for scams. Thanks for the article. While VA’s in Australia are in low demand, and Leveraged ETFs are yet to really hit our market, DIY IRAs (we call superannuation) are massively popular here. It’s the most common structure for retirement savings (by dollar value). I’m unaware of the DIY IRA popularity there bit going on OZ experience, I’d watch this space carefully. It has opened up new business opportunities via specialised expertise for willing advisers to serve that market. Cheers. David thanks for your comment. I’ve heard the term superannuation but I have to admit that I am largely unfamiliar with any of the details.